FREE SHIPPING. 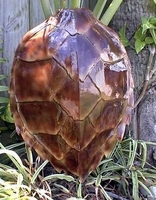 16" Hawksbill Turtle Shell Half Mount Replica.This is a fiberglass replica of a rare Hawksbill Turtleshell. The delicate coloration and glossy clearcoat finsh makes a magnificent trophy. You have to see this beautiful hawksbill turtle shell to appreciate the quality and detail. A "must have" for your collection. This turtle shell replica is available in brown and green. Please specify when ordering. Estimated time for shipping is about 2-3 weeks.